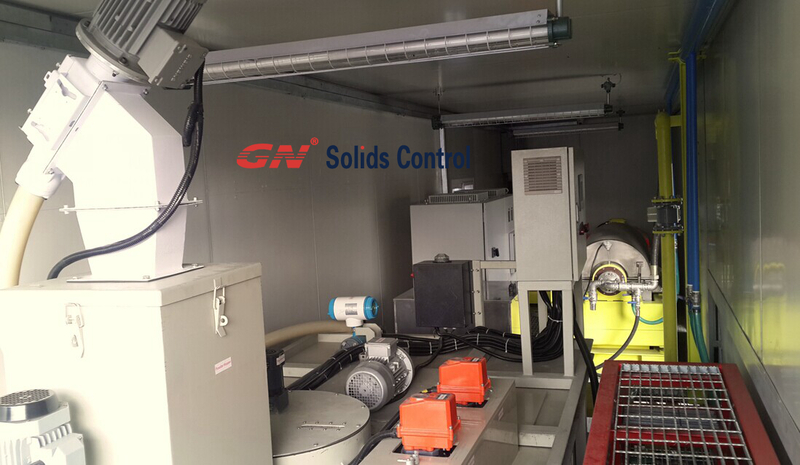 GN Solids Control was firstly known as a manufacturer of drilling fluids recycling equipment that are used to remove the solids in the drilling fluids, thus the drilling fluids could be reused. In China, there are several this kinds of manufacturers who can fabricate the traditional solids control equipment like shale shaker, mud cleaner, agitator and mud tanks. Keeping improving is one of GN’s features. In the past few years, GN has invested a lot on upgrading the traditional solids control equipment to make it easier for operation. Moreover, GN has developed many new products that keep GN a leader in the solids control industry. In the year of 2016, GN released the system for hydrocarbon recovery. It is an effective solution to treat the waste oily sludge. GN’s hydrocarbon recovery system is a three phase separation system. It includes primary coarse solids separation shaker package, fine solids separation centrifuge package and oil & water separation package. The working principle of GN hydrocarbon recovery system is to remove the solid particles step by step from the oil sludge. The high G force drying shaker unit is equipment with hot water spraying system for better washing performance, this process will remove most of the oil content on the solids. Decanter centrifuge is equipped with chemical dosing system for fine solids separation after demulsification process. 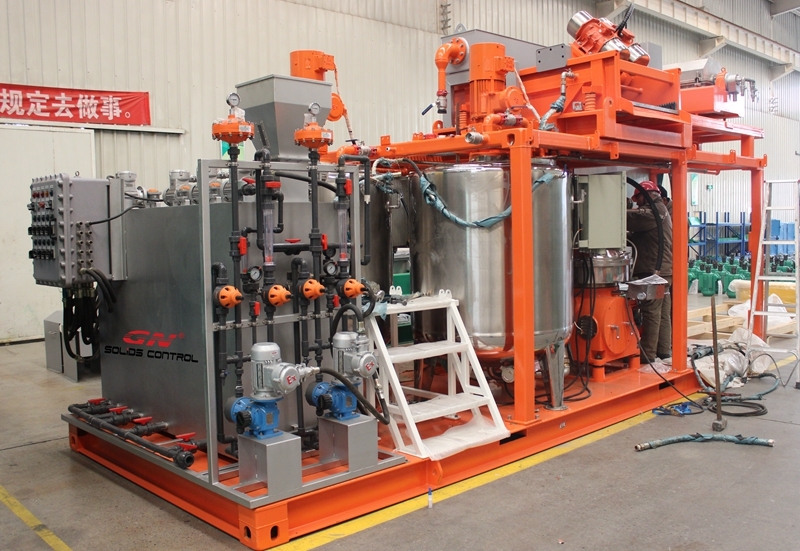 GN’s dosing system could be used in all kinds of dewatering system for ultra fine solids separation. The liquid discharged from the decanter centrifuge flows into the oil water separator package. Here an inclined plate clarifier is installed for further removing the remaining silt in the liquid for clarifying the oil and water mixer. Then the liquid mixer flows into the micro bubble separation for oil and water separating. GN’s hydrocarbon recovery system makes GN a real separation solution provider other than a solids control equipment manufacturer. GN would like to communicate with all the clients on this hydrocarbon recovery system. 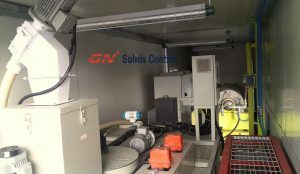 Solids control is one of the main jobs where GN’s centrifuge could be used. Now the latest design of GN decanter centrifuge is the C version with premier configuration. By the end of this year, 2 of GN premier decanter centrifuge caught up the last ship to Latin America for the solids control job there. Below are the main features of this premier model. High level material used for the rotating parts. The bowl is the core part of the centrifuge unit; the separation is process when the bowl is rotating. GN uses duplex stainless steel 2205 to make the bowl with centrifugal casting technology. The evenly material distribution ensures the excellent balance performance when rotating. Inside the bowl the scroll is made of SS316L which is much better than the other China suppliers who are using SS304. All around protection is put on the parts that will bear a lasting friction coming from the solids. The scroll is protected by 4mm thick tungsten carbide tiles that are replaceable for longer lifetime. The outlet port of liquid speeding up cone on the scroll is covered with ceramic liner. The same ceramic liner is also installed at the solids discharge port on the bowl. To prevent the building up of solids in the collection box, the tungsten material scrapers are fixed on the bowl to protect the bowl from wearing. To ensure the treating capacity, GN makes the slurry feeding direction and solids delivery direction same. This will speed up the solids delivering in the bowl. On the scroll blade, there are several openings allow the liquid passing through for large flow rate. 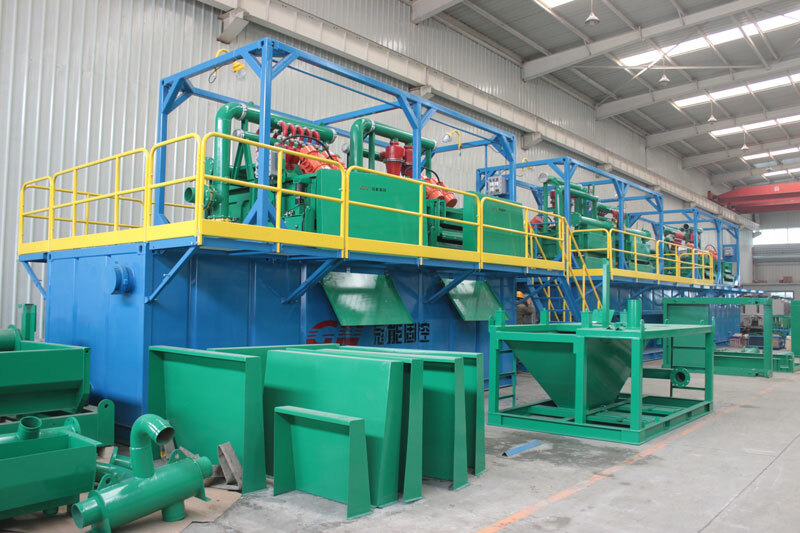 GN premier decanter centrifuge is also widely used in waste management like the waste cuttings treatment and the oily sludge recovery project. For safety consideration, GN premier decanter centrifuge is equipped with DNV lifting certified skid for transportation. Shale shaker is very common equipment used in the drilling mud recycling system. Its function is the first stage for remove the coarse solids in the drilling mud. Sometimes, we may see the double layers shale shakers are installed in the mud system. Below we would like to share some information on how the double layers shale shaker works in the mud recycling system. 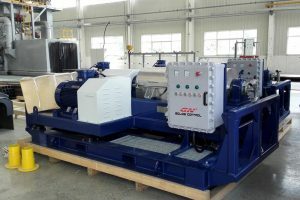 Some mud system may has limitation on the footprint, thus, the operators would like to equip a shale shaker with high treating capacity but compact structure. The double layer shaker no doubt is the ideal choice. For Mud Cleaner application – Shale shaker can also be used as underflow drying shaker by combining with hydro cyclone unit. This type mud cleaner functioned as both shale shaker and cyclone unit. The lower screen with coarse mesh is for larger solids separation, and the upper screen with fine mesh is for drying the slurry discharged from the cyclone. GN now has main two models of double layers shale shaker. One is coming from the shaker model of GNZS703. Its deformation GNZS706 double layer is for larger capacity shaker and GNZS705 for mud cleaner unit. The other is GNZS752; it can be upgraded to GNZS753 double layers. These double layer shale shakers are widely used in GN’s compact design mud recycling/de-sanding unit for area limitation project. the mud recycling tank skid, the solids control equipment like shakers, mud cleaner, and even decanter centrifuge unit will be installed for removing the cuttings and useless solid particles in the drilling fluids. After several times recycling, the useful mud materials will loss together with the cuttings, and then the mud engineer need add new mud materials into the drilling fluids to maintain the proper mud property for the drilling job. The mud mixing unit is the equipment used for adding the mud materials into the fluids. The mud mixing unit is always installed at end of the mixing tank. Before starting the drilling, the driller need have sufficient drilling mud to keep a continuous drilling. Thus at the first, the mud mixing unit is used to make the drilling mud by mixing clean water and mud materials. With the drilling going on, once the mud property is not proper for the drilling process, new mud materials like barite or other polymers need to be added into the drilling fluids. The mud mixing unit is sucking the drilling mud from the mixing tank, and then pump the mud together with materials back again into the mixing tank. Normally, the mud agitators would be equipped on the mixing tank for fully blending. 1. Centrifugal Pump – the inlet of the pump is connected with the mixing tank for sucking the drilling mud from tank. And the outlet is connecting with pipe manifold that will transfer the mud to the hopper unit. As this pump is fixed with the mixing hopper, it is also called mixing pump. This pump is driven by an electric motor via direct shaft connection. By higher efficiency shearing purpose, GN will used belt driving for a shearing pump. 2. Mud Hopper – GN’s mud hopper is Ventri type connected with the pipe manifold via a T pipe. 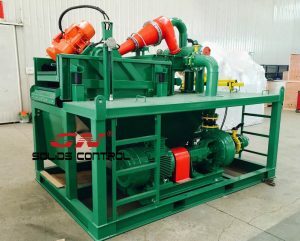 The mud materials will be added into the hopper and then immediately sucked into the drilling fluids as there is a vacuum produced by the high speed flow. 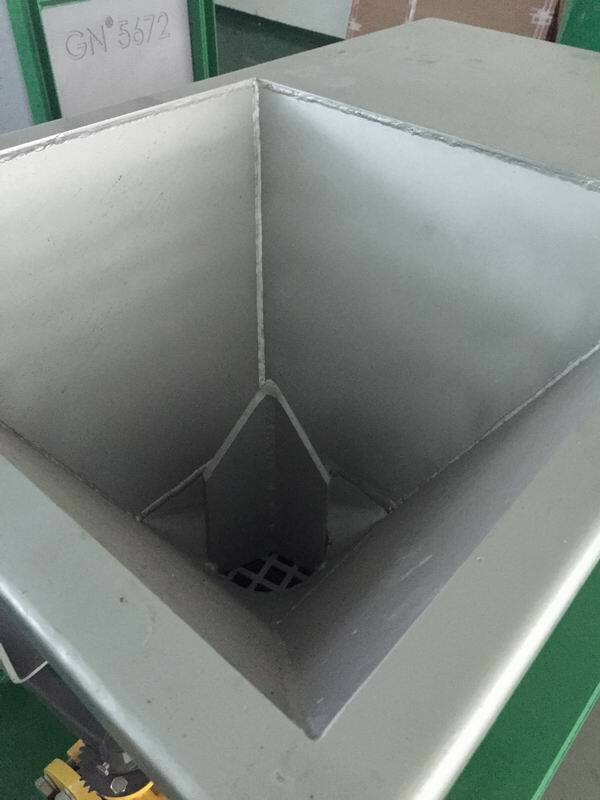 For the hopper, GN uses the material of stainless steel for better anti corrosion performance and long life time. Inside the hopper, there is a bad beaker for quickly adding of powders. On the pipe manifold, there is a pressure gauge for the operator to inspect the working pressure of the mixing pump. 3. Control Panel – GN’s mud mixing unit is equipped with explosion proof control panel for application in Zone 1. The operation of the control is easy for only three buttons on the panel. One on, one off and one for emergency stop, accordingly, the signal lights is installed to reflect the operation. GN’s mud mixing unit could be installed both at the end of the mixing tank or separately mounted on a small skid. 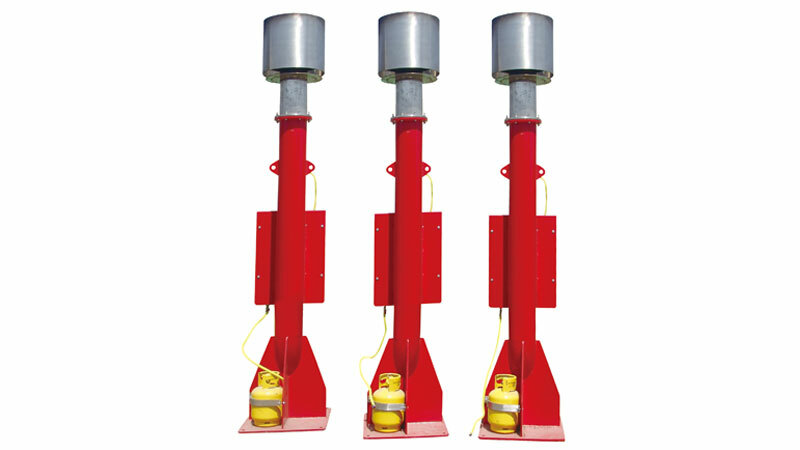 This mud mixing unit can also be designed as a dual hopper dual pump type for larger capacity or in case one of them is broken down. GN now has over 30 high configuration decanter centrifuge stocked for urgent request and prompt delivery. The decanter centrifuge is normal type equipment used in the drilling fluids recycling system for fine solids separation. 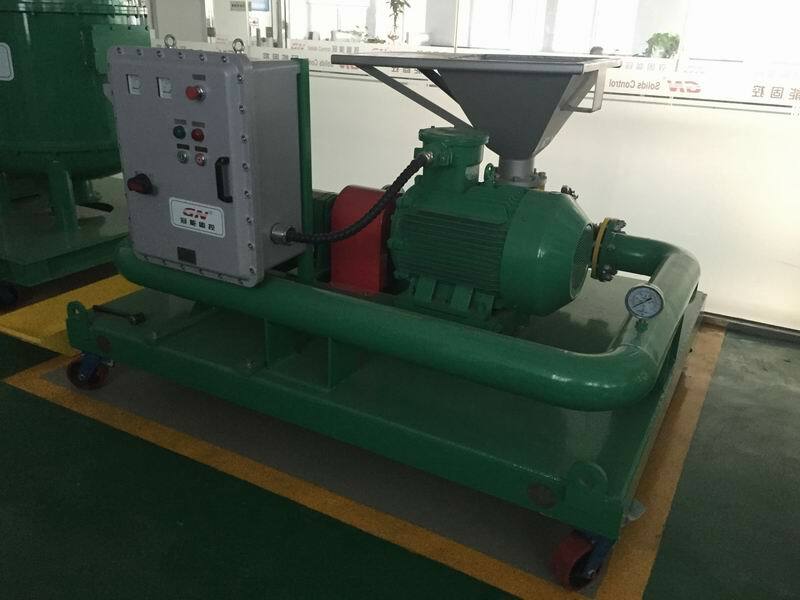 As a leading manufacturer of solids control equipment in China, GN always makes the inventory plan for the main equipment that most requested by the clients, like the shakers, decanter centrifuge etc. 3. Speed: Designed Max. speed is up to 3900RPM with recommended normal working speed of 3200 RPM. 4. G Force: 2062 @ working speed 3200 RPM, under this speed, the solids with size larger than 5 microns could be removed out. 1. Material: Bowl is made of Duplex stainless steel 2205, screw propeller is from SS 316. 2. Bowl Fabrication: Centrifugal Casting technology ensures better material distribution to maximum avoid casting defects. 3. Protection: Screw propeller is protected by the tungsten carbide tiles with uniformly thickness of 4mm, much better than spraying welding 2mm uneven surface. Solid discharge ports are protected by ceramic lining for long life time and less maintenance. Collection box has air spring for easy open and damping close to protect operator. 5. Control Panel: Both fixed speed and VFD panels are available as per customers’ requirements. Main electric components are from ABB, Siemens or Schneider. 6. Certificates: CE certificate for main machine, DNV lifting certificate for frame base, ATEX/ IEC Ex certified electric motors and panels are available hazardous area application. Sufficient inventory is a guarantee for customers’ urgent request and prompt delivery. Now is near the end of the year, and GN is starting the customers profit surrender plan. Call GN no hesitation and you can get a special discount. The business of today’s GN has been divided mainly into 2 scopes, one is the normal drilling mud recycling, and the other is the waste management including the waste coming from petroleum related and other separation industries. This blog is mainly talking on the drilling mud recycling system that used in non oil drilling industry. In oil drilling, the drilling depth and safety regulation request large drilling mud storage and more solids control equipment. Thus, the mud recycling system is always equipped with degasser unit and large volume mud tanks. Comparing with the mud recycling for oil industry, the unit for non oil drilling is more compact and less equipment needed. Trenchless/No Dig HDD project – The mud recycling system used in this type drilling is matching with a No dig rig. In some project for long distance pipeline and cables laying underground, it is inconvenient to dig an open groove on the ground as that will interrupt the normal traffic. The trenchless is an ideal choice. The mud recycling system for this project is always consisting of 3 stages separation as shale shaker unit, de-sanding and de-silting cyclone. Piling is the main method to install the bridge supporting pillar. A de-sanding unit with a small tank would be enough to remove out the coarse solids from the drilling fluids. The de-sanding unit is a composition of de-sander cyclone and shaker unit that can separate out the solids with size of 40-70 microns. Piling does not request very clean mud; less equipment involved makes the recycling unit for piling is very compact. GN also can manufacture the mud recycling system for tunneling project. For micron tunneling, GN has model available with capacity of 120m3/h, 240m3/h and 500m3/h. 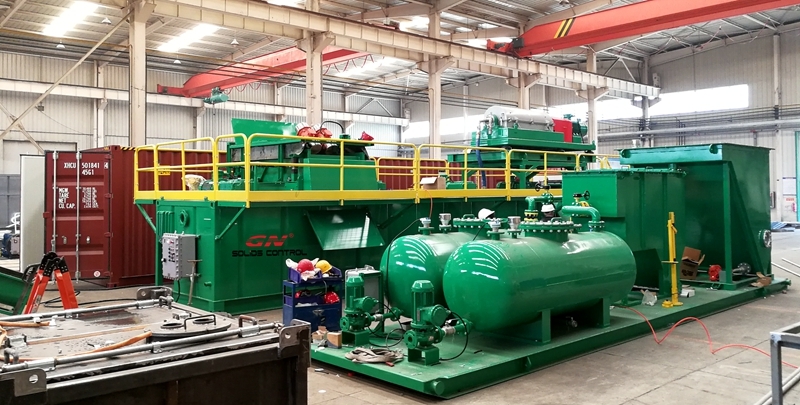 For large flow rate request, GN has the mud plant GNMS -3600M with treating capacity of 3600m3/H. Besides, GN’s mud recycling system can also be used in water well drilling, coal bed methane exploration, dredge slurry separation and the mining flushing waster cleaning process. Drilling cuttings would be produced when drilling. In order to recover and reuse the drilling fluids, the operator need remove the drilling cutting from the drilling fluids. 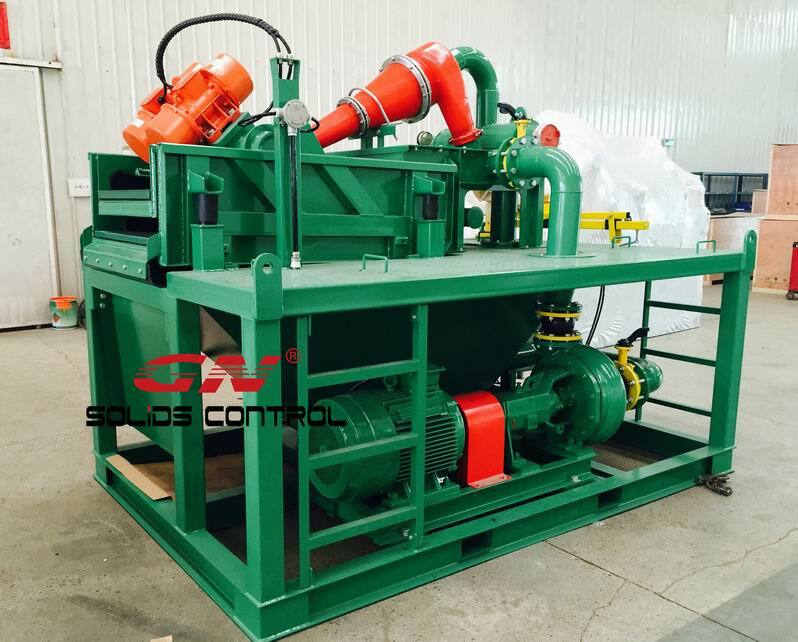 The well known equipment to remove the cutting from drilling fluids is the solids control equipment. So, what is the cuttings dewatering system? And how it works to remove the cuttings in the drilling fluids? The drilling fluids with cuttings coming from the well hole is fed to the shale shaker unit via the elevated pipeline, this the method used in oil rig package. For some other drilling project, like the no-dig horizontal directional drilling, the used drilling fluids would be collected into a pit on the ground, and then the fluids would be transferred by a slurry pump to the shale shaker unit. 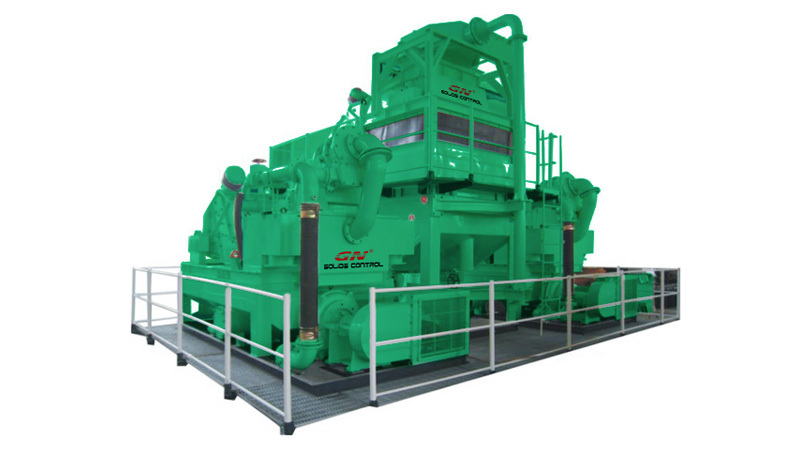 Shale shaker unit is the first stage for removing the coarse size cuttings in the drilling fluids. And then the de-sander and de-silter cyclone could remove out the cuttings with size down to around 20 microns. The used drilling fluids treated by the de-silter cyclone are already clean enough to be reused. However, the cuttings with size less than 20 microns would build up to make a heavy mud which is not suitable for normal drilling application. The dewatering system is especially equipped to remove the ultra fine solids that even cannot be separated by the decanter centrifuge unit. A decanter centrifuge like GN’s 22 inch model GNLW553 can remove the cutting with size down to 5 microns. For the even finer cuttings, we need a flocculation process to gather the ultra fine solids so that the decanter centrifuge could remove out. The polymer mixing system is a critical part of the dewatering system, GN’s polymer mixing system is designed with powder hose conveyer, automatic dosing system, mixing tank and diaphragm pump for transferring the polymer to the drilling fluids. For better flocculation process, always one acid tank and one alkali tank is equip to make the suitable PH value. Sometimes, the drilling fluids are mixture of water and oil, GN is also able to provide the oil water separator system for recovering the water and oil. information, please feel free to contact with us.